As you may have noticed, there was no Do the Thing! post last week. That was our goof; we got busy and distracted with other things, and before we knew it it was Tuesday morning and we’d both forgotten to write anything. Which happens sometimes. Life interferes, you forget, another deadline comes up and things just don’t work. The best laid plans, etc. And it can be worthwhile to swear for a second and set yourself maybe a better reminder for next week, but on the whole, let it go and do better next time. 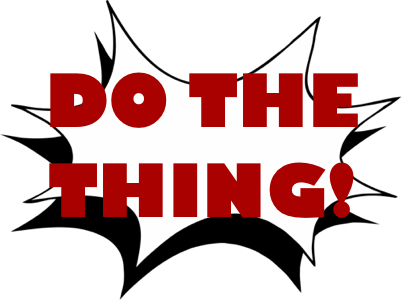 I think on this blog we spend as much time talking about doing the thing as we do talking about how it’s okay to not do the thing. Which may be odd, but our goal is efficiency and effectiveness in all things. When I struggle with something or miss a deadline or just plain forget, it’s really easy for me to struggle with the guilt and spend a lot of time beating myself up for the mistake in some mostly-misguided attempt to make sure I don’t repeat it. Which is really not effective. So when we say “Oops, we forgot the Thing, we’ll do better next time, what’s next?” we’re not blowing off the mistake. We’re just looking for the way to fix it — while juggling edits, finishing our NaNo, working on Book 4, breaking some new stories, and starting to blog about Doves — that gives us the maximum amount of time to do all the things. So what’s the thing you let slip this week — or the thing you’re working on not letting slip again?